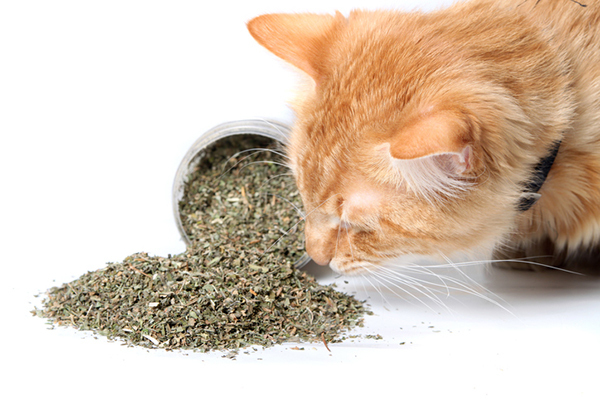 Next on The Scoop: I Want a House of Special Needs and Elderly Kitties — Am I Crazy? 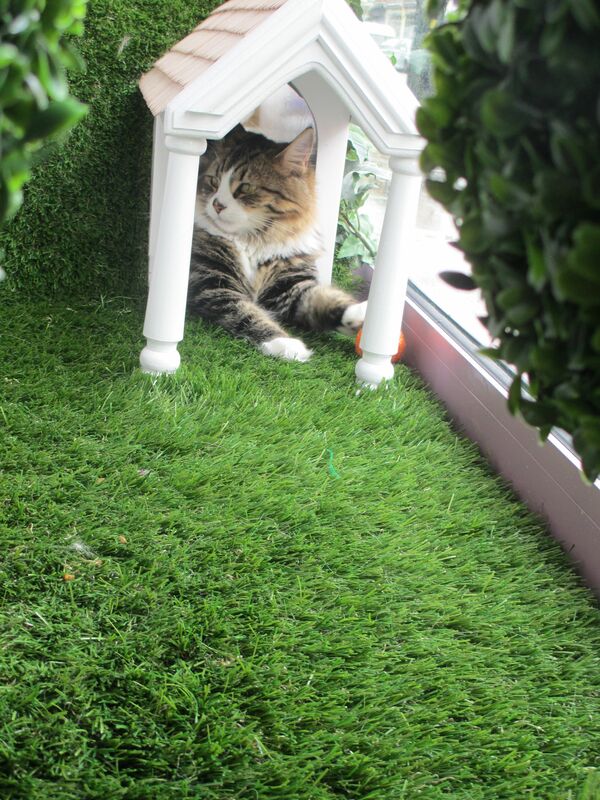 Visiting this cat cafe was among many cat-centric things my husband I did on honeymoon. I just got back from a glorious two-week “better late than never” honeymoon in Scotland and London. It was like the mothership demand-yowled and I came cowering, obediently with yummy tender vittles. 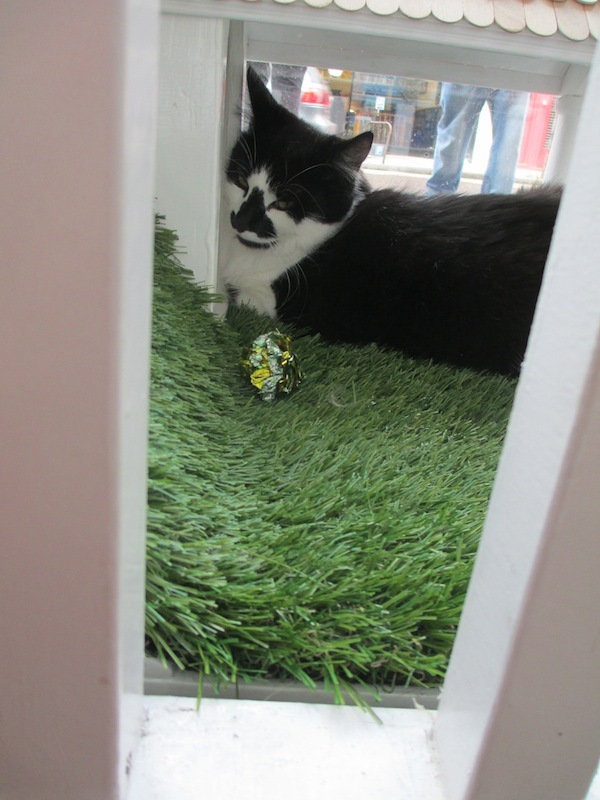 As “London’s first ever cat cafe,” Lady Dinah’s Cat Emporium is two levels of a charming, English cat-dream. 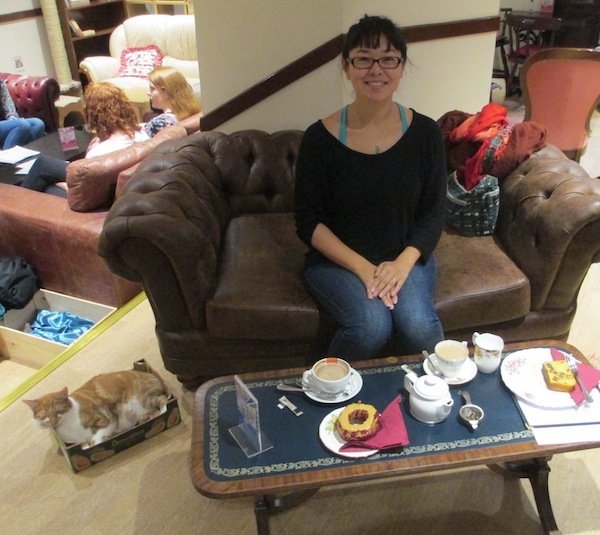 Tea, baked goods (they have gluten free stuff! ), and 11 rescued cats? Thank you, Lady Dinah, I’ll have another. We arrived promptly to our 11 a.m. appointment at Lady Dinah’s. 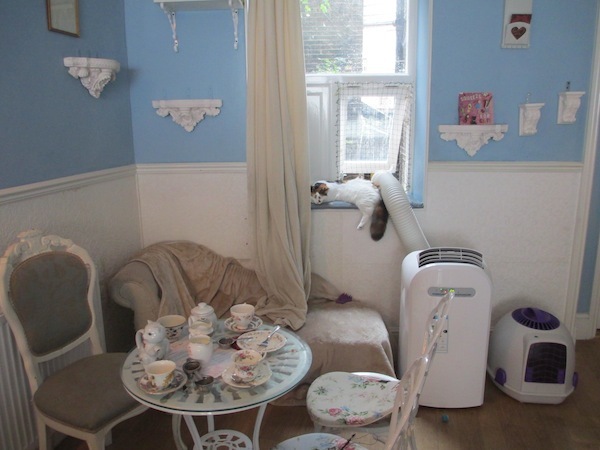 If you are going to be in London in the relatively near future and want to visit Lady Dinah’s, BOOK NOW. 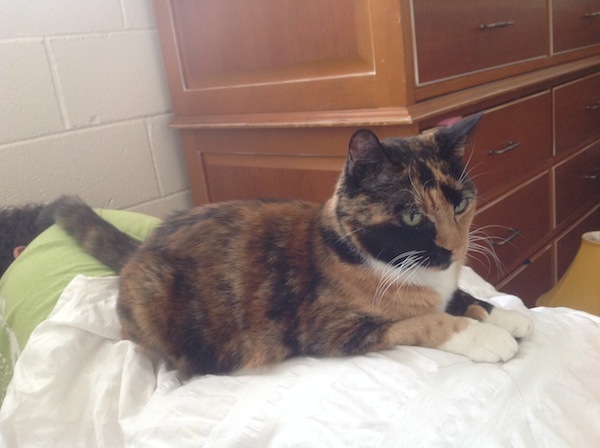 I cannot emphasize that enough — Lady Dinah’s recommends booking 50 days in advance. The first appointment I wanted disappeared within 10 minutes of opening up! We were first ushered into a small anteroom where the cool “front of house” gal told us the rules of the house. Basically, don’t disturb the cats if they are eating or sleeping, don’t pick the cats up, don’t feed the cats, no flash photography, don’t pester the cats if they don’t want to socialize with you. 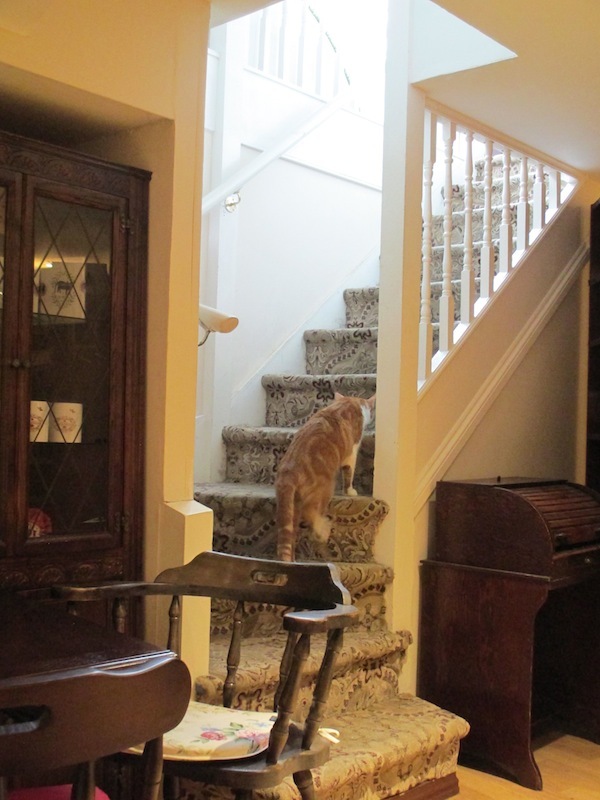 Essentially, Lady Dinah’s is the cats’ home, and you’re a guest. 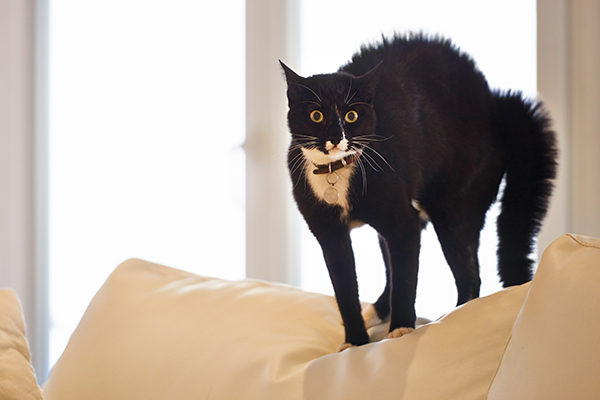 The cats dictate how friendly or unfriendly your interaction will be that day. So it was just like at home. Sweet! After carefully washing our hands and hanging up our coats, we entered the cafe through an inner door. The first level of the cafe was bright and charming. 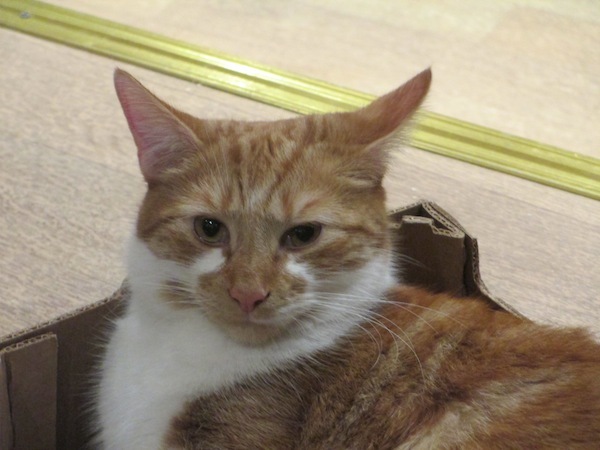 I suspect it was still early in the day for the cats, so it was relatively quiet. 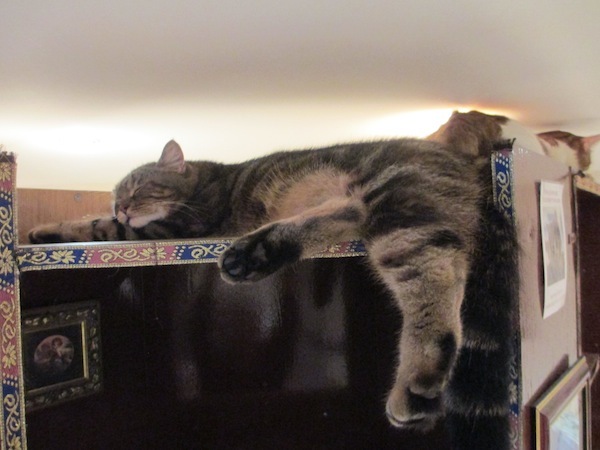 Deciding to let sleeping cats lie, we went downstairs to the lower level, to find a table and order our tea. 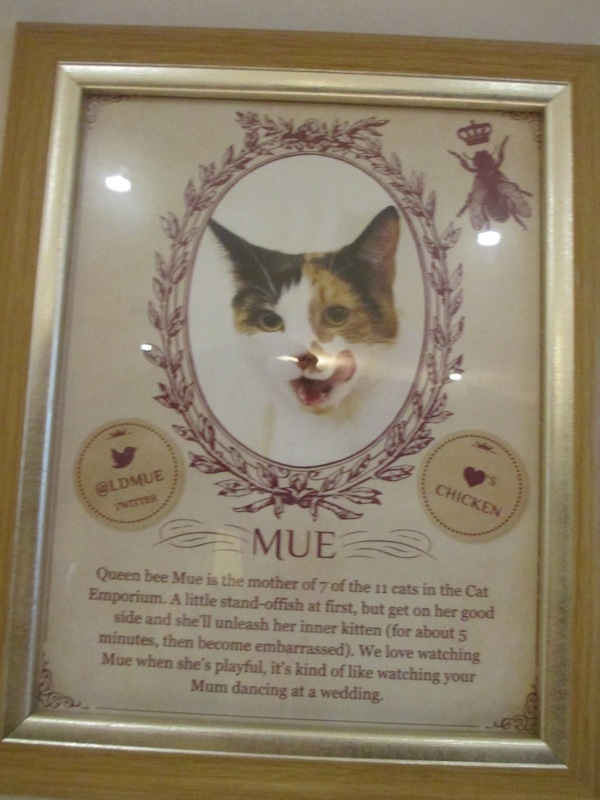 Upon entering the lower domain of the kitties, the first cat we encountered was none other than the “Queen bee” herself, Mue. Mue is the mother-cat to most of the kitties at Lady Dinah’s. 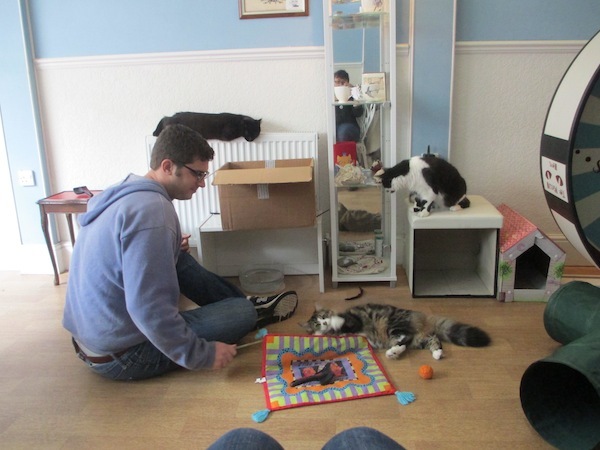 One of the wonderful staff told me that all of their cats are rescue cats, and that the majority of the 11 cats are from a litter of Mue’s. 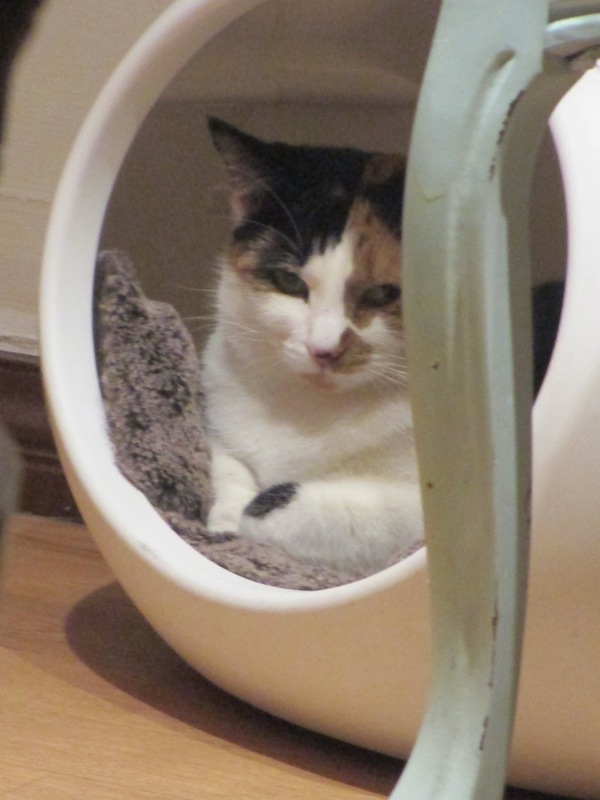 Apparently Mue and her family needed a home, her previous owner could not keep them, and then in stepped Lauren Pear (founder and owner of Lady Dinah’s) to give them a home at Lady Dinah’s! 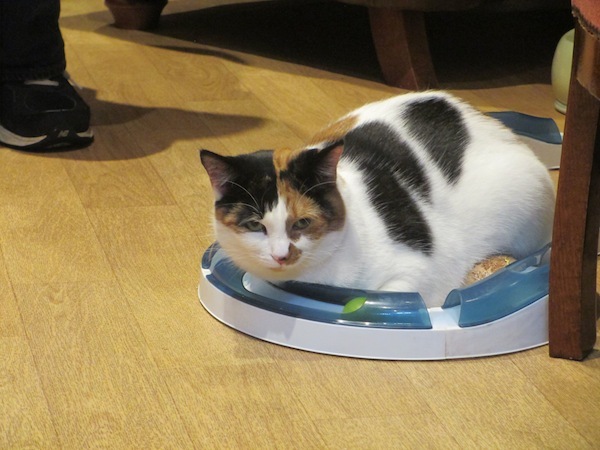 Other cats are adopted into the clan through the help of various local London rescue organizations, but Lady Dinah’s makes it clear they are careful to strike a balance between giving cats homes and not upsetting the existing kitty family. 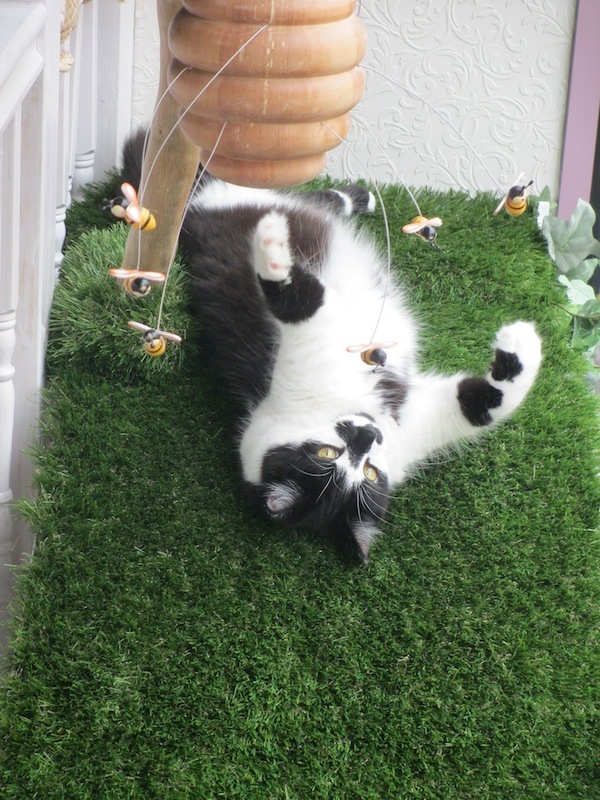 Lady Dinah’s Cat Emporium was indeed a labor of love. 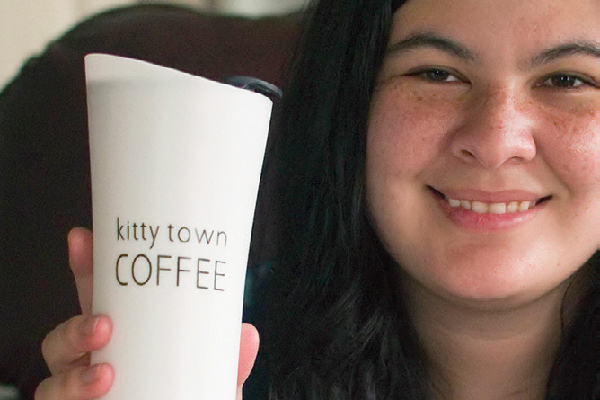 It took 18 months of crowd-funding through Indiegogo to get Lady Dinah’s up and running. 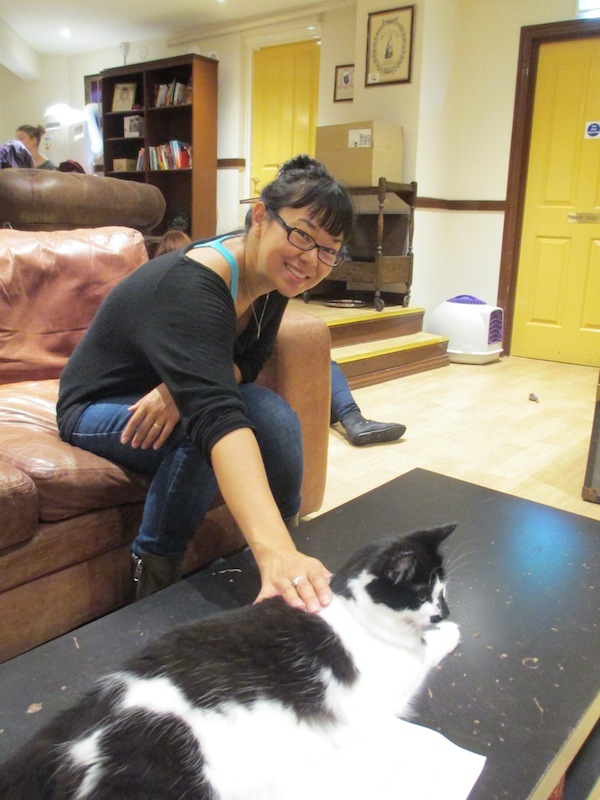 In the end, Pear created a uniquely London cat cafe that seems to indeed be a sanctuary for the happy kitties. But back to the cats. I definitely follow Mue on Twitter. I had a surprisingly delicious tea with gluten free (yay!) cake. Indiana (or was it Romeo?) decided to grace us with his presence as we ate. He really liked that box. 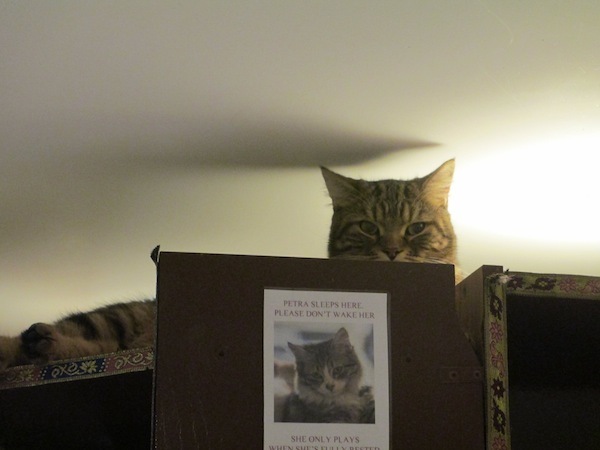 And just as we were about to head upstairs for some play time, I spied Wookie, well, spying on us! Note the sign below him. 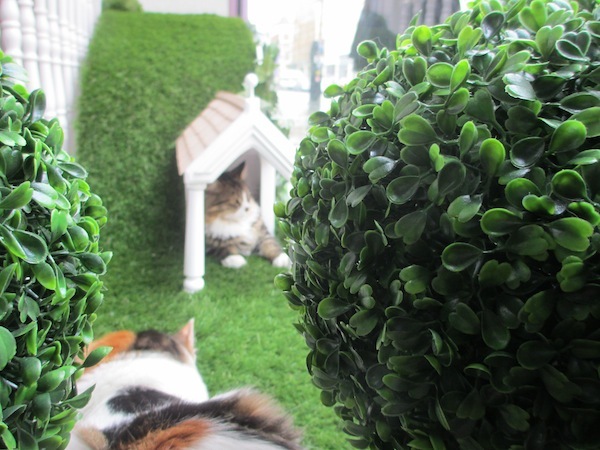 Petra was out and about, but they are quite vigilant about protecting their cats’ sleeping areas. There was an entire “off limits” fortress for the kitties behind the bookcase when they need a reprieve from the adoration. We made are way upstairs, where it sounded like things were picking up. And we weren’t mistaken! Petra was in a playful mood, and she invited my husband to play too! Loki looked on (black cat on the radiator) while Carbonelle wanted to get in on the action. 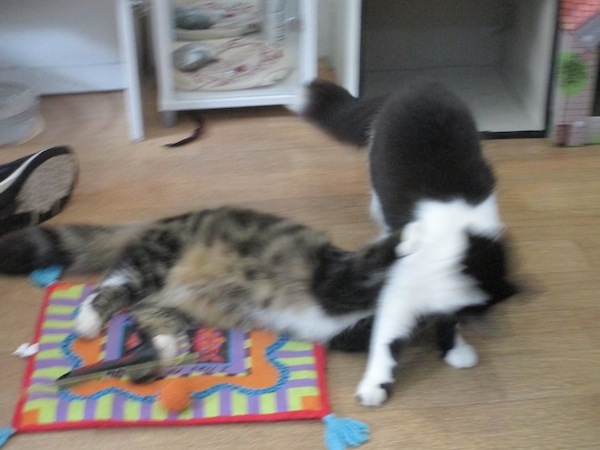 They did this for about 15 minutes — tumbling about, chasing each other across the cafe floor. And the entire time, all the Emporium patrons sat rapt. Shutters snapped, humans awww’ed, and the cats felt free to be cats. … and we were on our way. We carefully excited into the anteroom where we had first paid (┬ú5 cover charge, per guest) and received instructions. Of course we bought postcards and bags and buttons — all for the benefit of the kitties right? 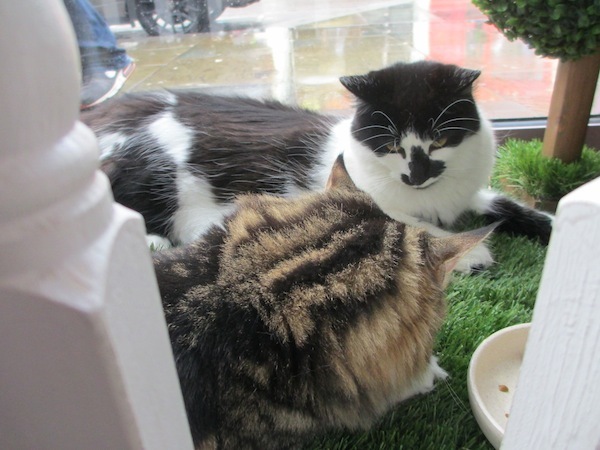 And then, all too soon, our London cat cafe — no emporium — experience was over. Leaving Lady Dinah’s my cat withdrawal was both quenched and intensified. I wanted nothing more than to go home to my sweet kitties and smother them with scratches and admiration. 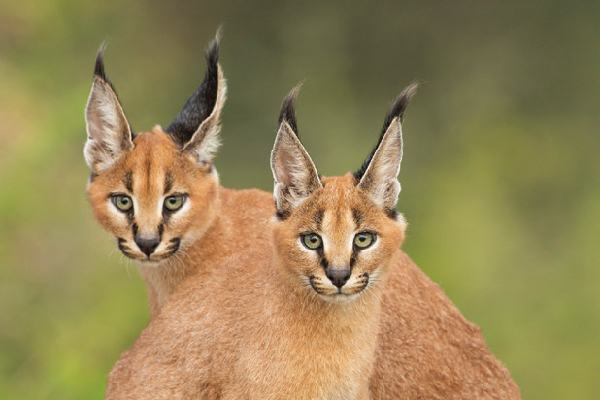 It was all the warm fuzzies about the kitties because of the warm fuzzy kitties. 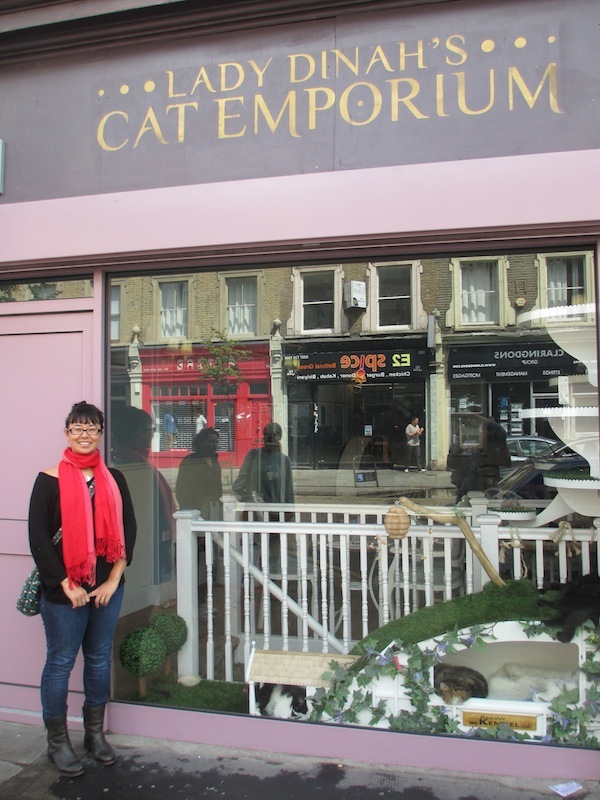 But regardless of whether you’re missing the cats in your life or just need some cats in your life, check out Lady Dinah’s Cat Emporium the next time you’re in London for a purr-fect cup of tea. About the author: Louise Hung is a morbidly inclined cat lady living in Yokohama, Japan, with her cat, her man, and probably a couple ghost cats. She also writes for xoJane. You can follow her on Twitter or drop her a line at IamLouiseMicaela@gmail.com.